Fiji, known for its beautiful, swaying palm trees and white sandy beaches has incredible aqua marine blue water, teeming with life! These are truly islands for adventure! Created by volcanic activity, Fiji is a group of more than 300 islands that lie in the South Pacific. 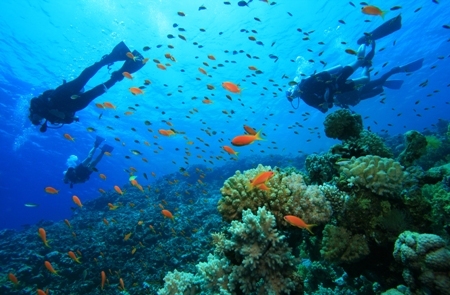 Though known for leisurely days of waterfall swimming and rain forest hikes, Fiji has amazing scuba diving! In particular, the island of Taveuni, also known as“The Garden Island” has gardens above and below its wonderful waters! The Fiji island of Taveuni lies next to the body of water known as the Somosomo Straight. This narrow stretch of sea explodes with breath taking panoramas! In contrast to the Caribbean, the colors and textures of the reef, can assault the senses of any first timers to this incredible location! Nutrient filled waters here can support a large rich marine ecosystem full of life. It is no surprise that Fiji is known as the “Soft Coral Capital Of The World”. Not only the spectacle of the colorful coral, but teeming wildlife abound on these reefs! Expect to see plenty of pelagics such as reef sharks, barracuda, and rays! Lots of small ornate nudibranchs, flatworms and other exotic marine life thrive in the nutrient rich currents here. Rainbow Reef and the Great White Wall considered the number 1 best dive site in the world by Local Adventurer Magazine! Taveuni, Fiji is a dive destination you do not want to miss! Round trip airfare from Chicago to Taveuni! Round trip ground transfers from/to Taveuni Airport! 7 night accommodations in an ocean view room! Refreshing welcome drink on arrival! Daily cooked breakfast, 2 course lunch, 3 course dinner! Afternoon cookies/tea and fresh baked goodies! 5 days of 2 tank morning boat dives with tanks, weights and refreshments! Shore diving during dive shop hours! 2 free afternoon boat dives-3rd tank (Must be same day dive for whole group)! Cultural night with Lovo Feast and Meke dance performance! Divers! The pricing for all this is an incredible value for an amazing adventure! Your signup deposit for $500.00 is due on December 10th, 2018.